Now you've got a stereo power-amp that will draw nearly10 amps out of the wall, pump nearly 400 watts at 4 ohms before clipping & sound like a million bucks while doing it. Heavy metal, funk, classical, or rock'n'roll, it doesn't matter. Feel free to crank whatever music you wish. Is it any good as a surround amp? I could give a ###...this thing kicks royal a## in stereo. I bought the TX-SR805 in March 2008 to use as a surround sound amp, powered zone 2 amp, and zone 3 pre-amp. The amp worked great until last September (2010) when the surround sound quit working. 6 months later and $500 in repairs, the amp still doesn't function properly and is unusable. I called Onkyo to resolve this problem and they told me that since the amp is out of warranty that they would not work with me. This is terrible customer service and as a result I will be replacing the amp with something other than an Onkyo. Overall, the amp had a lot of good features, but it was really heavy, ran very hot, and has problems with the DSP board. My opinion is that this amp is not designed properly for everyday, normal use, as it runs extremely hot. I believe this excess heat is causing the problems with the DSP board. 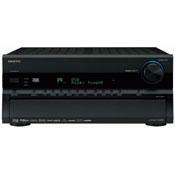 In any event, I do not recommend this amp and I do not recommend Onkyo due to their poor customer service.